With wedding costs coming in between £25,000 and £45,000, it isn’t any wonder that would-be married want to save money on their wedding. However, these same couples often worry that their wedding will look cheap if they must follow a strict budget. But that doesn’t have to be the case. Savvy couples know that practical ways exist that allow them to save money and yet still have a stunning wedding. If you’re about to plan your budget wedding, then you’ll want to begin the planning process right now. 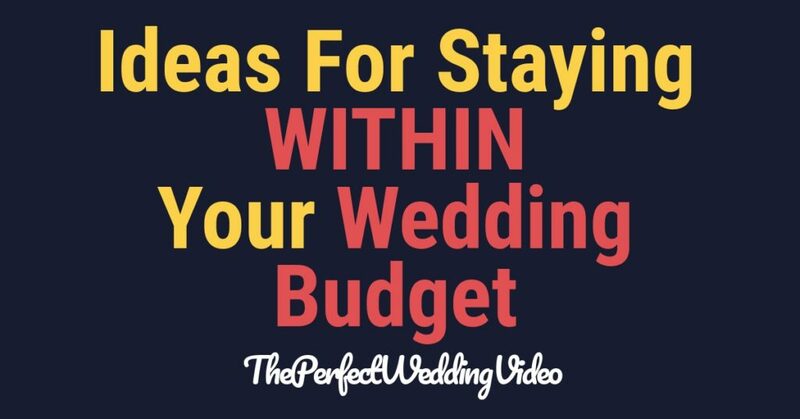 Doing this plus following the five tips on this list will allow you to have a gorgeous wedding at a bargain price. Doing research before you establish your wedding budget counts as the most important step you can take toward reaching your wedding budget goals. If you don’t know how much something normally costs, then it’ll be tempting to allow your budget to run all over. Fortunately, Nerd Wallet has produced a handy graphic to help couples establish a baseline price for each item/ service. For example, most wedding videographers run about £2,000 (although at The Perfect Wedding Video, we have packages to suit all budgets!) Most wedding dresses cost £1,600. And most bands charge around four grand to play at a wedding. You and your intended should itemize each thing on the list and determine where you can cut corners. A surprising number of ways exist to help you do just that. Once you do that, then you can establish a working budget and go from there. Missed overtime fees: Watch out for professionals, like the DJ who charges more after the allotted time has come and gone. Same for catering staff and other professionals. Hidden costs: Do you need stamps for your wedding invitations? How about gas and other car fees for your rental cars? Tips for your service staff? Forget about those? Yeah. You shouldn’t. They’ll break the bank and your budget. Vendor samples/ trials: Is there a dish you want the caterer to make? Watch out. That sample dish may cost you. The same can be said for the facial you get from the stylist or the florist’s sample mini-bouquet. Be sure to ask these professionals about these costs so that you’re not surprised. We often forget that some of the most talented people are also people we call friends and family. For those who count classical musicians, up-and-coming DJs, and other talented folk among their friends and family, The Simple Dollar recommends that the would-be marrieds ask them to provide the entertainment. This entertainment sampler can replace a 3D gift from these talented folk, and will make your wedding more intimate and special to boot. This particular tip kills two birds with one stone. Flowers can cost you dearly. However, if you opt for a wedding in your aunt’s backyard (or some other cheap/ free place), and she just happens to have a beautifully manicured lawn, then you’ll get both a beautiful wedding venue and some of the flowers to boot. The way to maximize this savings is to visit the site where you’ll marry. Take a look at the flowers and plants in the natural environment. Create simple bouquets and boutineers from the same type of flowers. For example, if your aunt keeps roses, then you carry a simple bouquet of six roses, give your bridesmaid/s a single rose or two in a pretty bow, and have the guys wear a single rose as a boutineer. You and your party will look simple, yet elegant against the natural features of the yard. Better yet, you will stay within your budget. If you’re planning your wedding months in advance, then shop the end-of-the-season sales and be sure to buy off-rack instead of having something made specifically for your wedding. Additionally, choose styles that offer a broad range of sizes so that each person in the wedding party is accommodated. Finally, as a side note, the fewer bridesmaids and groomsmen you have, the fewer outfits you have to purchase. It’s perfectly acceptable to have just a Maid of Honour and a Best Man. It sometimes seems that the budget-minded couples can’t catch a break when it comes to saving on wedding expenses. However, that doesn’t have to be the case. If you’re getting married in the near future, then it’s important that you establish your budget right away. It’s also important to look to places within the wedding budget, where you can save money. Asking friends to perform services at your wedding or getting married in a friend’s backyard count as just a few of the ways you can make this happen. Your budget wedding won’t look cheap if take the bull by the horns long before the wedding bells chime.